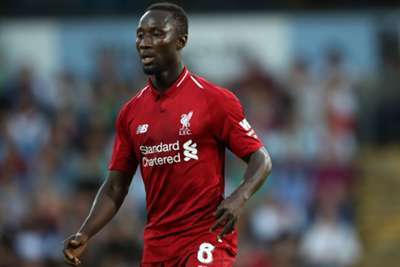 Liverpool have been dealt a potential injury blow after Naby Keita had to be carried off the pitch by a team-mate due to a suspected thigh problem during Guinea's match away to Rwanda on Tuesday. Keita sustained the innocuous-looking injury right at the end of the first half and, with a stretcher not readily available, he had to climb on to the back of a team-mate to be carried away. It remains to be seen how serious an issue it is, but he could be a doubt for Liverpool's trip to struggling Huddersfield Town when the Premier League resumes on Saturday. Keita is not the first Liverpool player to suffer an injury during the current international break, as Sadio Mane reportedly fractured his thumb while away with Senegal. Virgil van Dijk (rib) and Mohamed Salah (muscle strain) are thought be available for the weekend, however. Jurgen Klopp's men sit third in the Premier League after an eight-game unbeaten start to the season, with Manchester City and Chelsea ahead of them on goal difference only.